Brian McGill knew he wanted to become a teacher when he was a sophomore in high school. When he was going through difficult times he had influential teachers who were there for him, and he wanted to “pay it forward” by becoming a teacher. In addition, he felt he could relate to kids well. McGill has been teaching English for 22 years. He taught in Pennsylvania, New York and New Jersey before coming to Virginia. 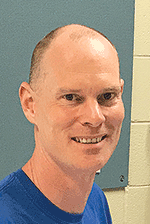 He spent the first 12 years of his career teaching Advanced Placement Literature in high school, but switched to middle school when he moved to Virginia. He now teaches Cougar Academy students and honors students at Carver Middle School. McGill said he chose English because he feels it is the study of the human condition, and students will never question why they have to take it vs. a subject like math. He said he uses literature to teach real-life social skills, whether about relationships or how to handle conflict or adversity in life. “If we’re reading stories, those characters have personality traits that are out in the real world, so when we study them, you can understand people better, and if you understand people better, you can have better relationships,” he said. McGill said his favorite part about being a teacher is connecting with students. He sometimes has conversations in the hallways with kids even if they aren’t in his class. McGill was born and raised in Philadelphia, and said he still misses home. However, he no longer has the edge that he had when he lived there. He realized he didn’t need it anymore, he said, and that it wasn’t a necessary part of his personality. “I feel like I’m a better version of myself here because I’m [happier] and content and less combative. I don’t thrive on conflict like I used to up there because it’s not necessary,” he said.